Is it possible not to appreciate this incredible film? How often have we had the chance to find out about what it was like for young, and not so young, Iranians to live through the revolution and then endure the war between Iran and Irak; a war which lasted eight long years and claimed more than a million lives? 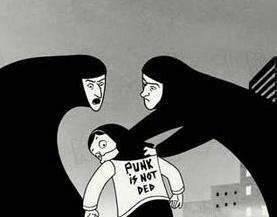 Persepolis is the poignant story of a young girl whose family lives in Teheran and whose grand-father, a prince Adjar and a communist, was killed by the Shah when he came to power some 50 years previously. Many members of her family have at some point been imprisoned or killed by the existing regime but is it really going to be that much better with the new one? Everyone is looking forward to a republic but do they really get the freedom that they were all looking forward to and aren’t women the ones who lose most in the process? The film takes us step by step through the changes that the country experiences over the years up until today. The film clearly asks he question: “what is freedom?”. Is it being allowed to listen to the music you want to listen to? Or dress the way you choose to? Or even drink alcohol? Or even being allowed to think and say what you want? For this young girl, she sees her life change from being relatively happy and frivolous to being forced to hide to live what we would see as being normal and what Iranians used to see as normal. Her extravagant grand-mother, divorced and remarried at a time when this was just not done, who smokes the pipe and has some strong opinions, is there to be her voice of reason and the guardian of her integrity. The graphics are particularly strong and provide the perfect background for the feelings and the moods she is going through at each moment of her chaotic and testing life. This Film is a must-see at a time when we are questioning, more and more our religious values and trying to understand another world. This film is sure to give you food for thought.